There are very few certainties in life, and death, unfortunately, is one of them. Whether its cold inevitability terrifies you to, well, death, or you embrace the finality of life and use it to spur you on, death is unavoidable, and a path we all must tread at one time or another. Paradoxically, death is a huge part of life, and the way that various people around the world approach the issue is a truly unique feature of the human condition; no other living organism mourns, grieves and honours their deceased like humans do. Depending on where you are born though, your views on death are likely to differ – but who’s to say who’s right, and who’s wrong. 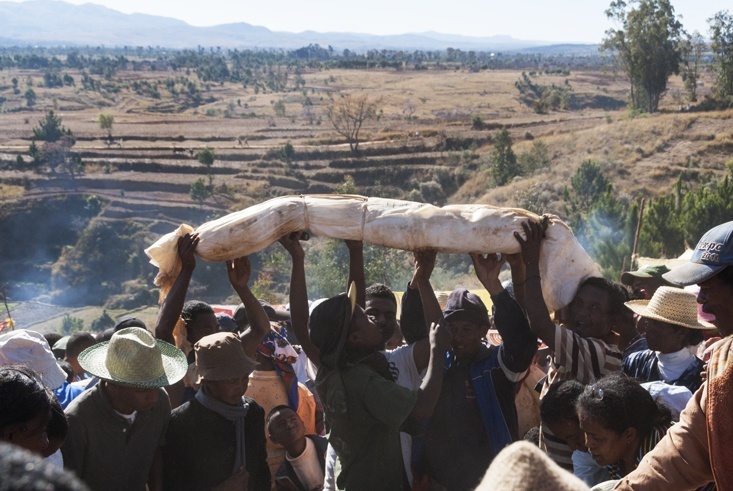 Having said that, a certain festival in Madagascar called Famadihana or “turning of the bones”, is so outside the realms of what we would deem as ‘ordinary practice’, that it’s hard to believe. That’s because every seven years, family crypts are opened up and the remains of dead ancestors are brought out, wrapped in cloth and lifted in the air as people drink and dance around with them in celebration. I’m not sure I’d want that- I’m pretty antisocial at the best of times – even when I’m alive and kicking. I always kick up a fuss about going to family parties and get-togethers now, so the thought of being turfed up when I’m dead and forced to enjoy a celebration/party is my idea of hell – and for all I know I might actually be in hell by that point. 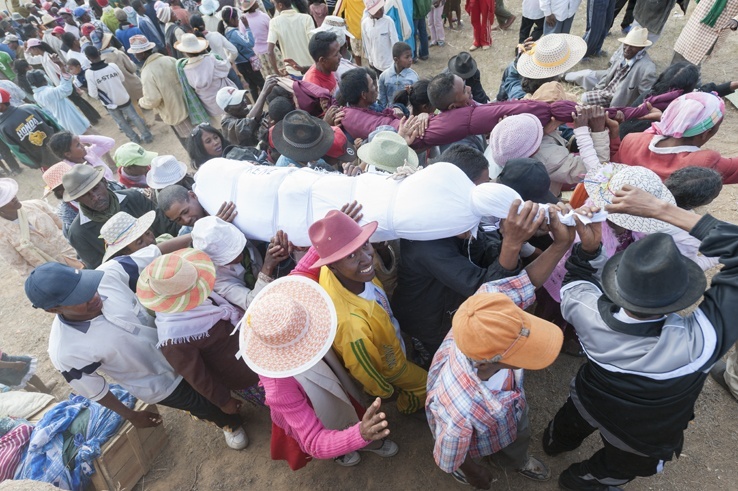 For the Malagasy people though, death is not the end, and every so often the spirits of the dead wish to return to Earth after passing onto the world of the ancestors. They believe that until the bodies decompose completely, the dead do not leave permanently and are able to communicate with the living. So until they are gone forever, the Famadihana festival is a way for people to still show their respect, love and affection to their family members, whilst acknowledging the fact that they have not forgotten about them. The festival is a truly unique feature of life on the Indian Ocean island, and is a ritual that has been carried out for centuries. Some suggest it may even have its roots in the traditions of South East Asia, some 6,000km away from Madagascar. A festival for all members of the community, it is often a very crowded affair. Bands play live music with old trumpets and clarinets, people socialise, drink traditional rum, dance near the tombs, sacrifice animals and hand out the meat to guests and family members, and there are even some stalls set up to sell items like cigarettes and frozen yoghurt. It sounds like a pretty good day out to be fair, and not completely different to my weekends – well, apart from the animal sacrifice. After the corpses are wrapped and brought out into the open, they are lifted onto people’s shoulders, and with much laughing and enjoyment they are carried and danced around the tomb. As the bearers get more into the celebration the bodies are lifted even higher. Sadly, the practice of Famadihana is on the decline, due to the fact it is so costly- many people cannot even afford the silk shrouds that are used to wrap the deceased. Early missionaries discouraged the festival too, with Evangelical Protestants dismissing the custom completely. Thankfully, the Catholic Church are more accepting of the custom now, regarding the festival as a cultural event rather than a religious one. I think it’s pretty refreshing to see a different attitude towards death, even if on the surface it seems a little morbid. I’ve always found our approach to death in this country a little odd; for me, death is what makes life sweet and I don’t necessarily think it has to be as sombre an affair as we make it (unless, of course the death is tragic, or premature). This is clearly a sentiment felt by some of the people of Madagascar, and although I’m not suggesting we dig up our grandparents and have a boogie with them, I don’t think it’s a bad idea to see death in a more celebratory way than we do. In any of my next of kin are reading this though, I still want to be cremated. What do you think about the festival? Let us know in the comments below.